I'm sure you've seen word clouds before; there are several free sites out there that will scan your website and spit out the most frequently used words into a design like this. I've had some of you send in examples that used Epbot before, so while brain-storming something unique to bring Dan to sign I thought of making a Ghostbusters-themed cloud. In addition to scanning websites, these cloud generators also allow you to cut and paste in large blocks of text, which is where I hatched the plan of manipulating the input text to get only the words and phrases I wanted in the cloud. First I went through the Ghostbusters script and pulled out every line of dialogue Dan/Ray utters. From there I grabbed only the most relevant and/or interesting words, making sure to include my favorite phrases like "GET HER!" and a reference to the mass sponge migration. Helpful Tip: To make the words in a phrase stay together, you have to use a ~ between them, with no spaces. Like~this. (And I'm not going to tell you how long it took me to find that symbol on my keyboard.) Sadly there's no way to make punctuation transfer, though. Once that was done I plugged the whole mess of jibberish into Wordle (my free services of choice) and commenced playing. There are so many design options, from word orientation to fonts to custom color themes, that this took the bulk of my time. Not to mention IT IS VERY ADDICTING. This made everything clear and legible, but sadly all my lovely muted pumpkin tones turned into neon carrots. I say again: GRRR. Oh, sure, NOW you match the screen. JERK. Still, it was great fun to make, and Dan's signature looks nice on the black background. Besides, my office has so many crazy colors already that I doubt this will look too out of place. P.S. 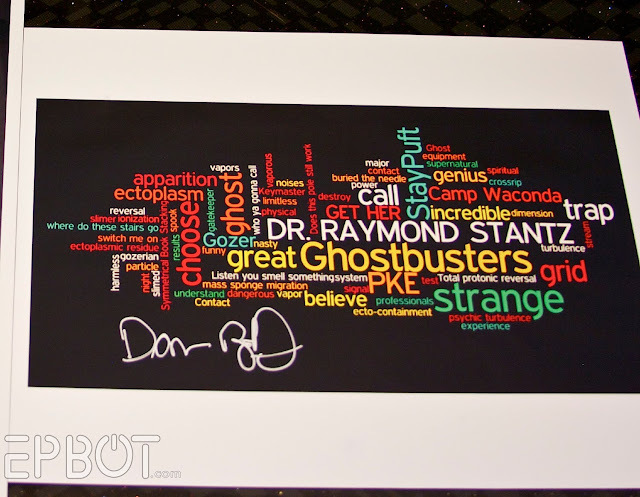 I have an extra glossy print of the colorful word cloud - the version Dan signed for me. Any of you want it? Let me know in the comments, and I'll pick someone in a few days. I'd love the extra print for my 3.5 yr old son who is OBSESSED with the ghostbusters. His 3rd bday theme was ghostbsuters as well as his halloween costume!! He also has a ghostbusters themed room that this would go great in!! I'd love to have it, Ghostbusters was the only movie we brought overseas with us when we lived in Germany in the late 80's, early 90's! My hubby always laughed at me for watching it again and again, even after I had memorized it! It's still one of my top three favorites, along with Beetlejuice and The Princess Bride. You did a great job with the art!! Oh yes please! My husband and I love this movie, and have been quoting it since we met 7 years ago! This would be perfect to hang next to his signed Magneto print by Ian McKellan! Do I want it? Do I?!?! Um, yes, please. My boys would really get a kick out of it. They were Ray and Peter for Halloween last year. And as a child of the 80's, I'd love it, too!! Wow, those look amazing! I've been wanting to play around with word cloud art, it looks so fun. I would love to win your extra copy, my hubby and I are both big Dan Aykroyd fans. Sing that outloud. It's awesome. I just made one on Tagxedo for the Blues Brothers, which is the movie that made Dan Akroyd my favorite actor at age 5. Thanks! Forgot all about wordl! Thanks for the reminder! You did a great job.... on ALL versions! LOL! I wonder if Tagxedo just doesn't like Safari... didya by chance try it with any other browsers on your Mac? I had terrific results with Tagxedo (on my PC) for creating a word cloud portrait of my son. What a fun project! And thanks for giving us the step-by-step, hold-my-hand instructions ... I think I'll have to give it a try! You always have the coolest stuff. I got the Tagxedo to work on my MacBook Pro….so.much.fun. I'm hooked. I only made two quick ones from my blog and I have to say yours is wayyyyy cooler but it is still fun. Thanks for again sharing something cool to do. I like the colors and font from the first one, in the layout of the second one. I love the idea of making some for my kids. Such a great idea! FYI, I don't want the extra one. There are plenty of more deserving, bigger fans out there than I am. 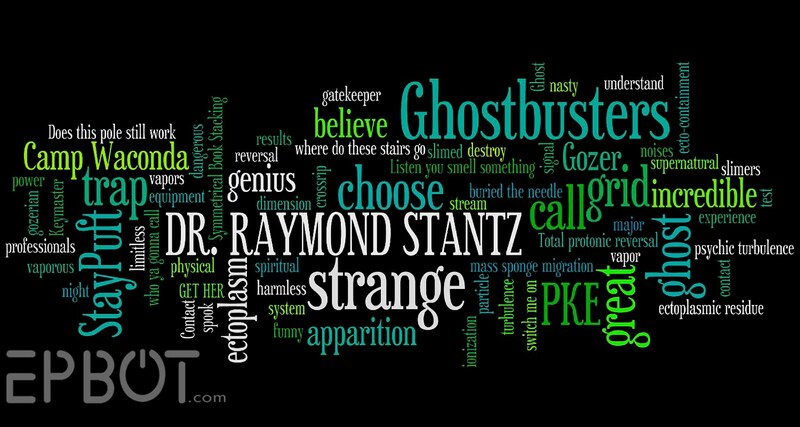 only do I LOVE Ghostbusters but I love Dan Aykroyd. Anyway, I'd completely love the autographed word art cloud! ...but what did Dan A. say about your genius art project? 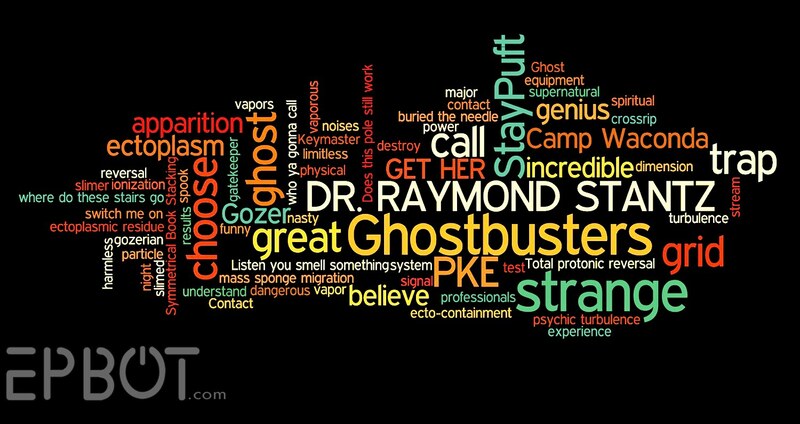 The Word Cloud is awesome. Dan Aykroyd was my favorite actor as i was growing up especially after ghostbusters came out.I lould love to have the autographed word cloud to hang on my wall. Yes!!! Pretty, pretty please. My daughter dressed up as the StayPuft Marshmallow man last year when she met Ernie Hudson at our local comicon. (He said he liked her costume) We would love to have this to hang next to her photo! Do you see me begging?, cuz I am. I would love it, for my geeky fiancé's upcoming birthday! Does anyone want it? Holy Stay-Puft man, yeah! This would be the perfect birthday present for my brother, who bears some resemblance to Dan, himself. OMG! I want it! My husband is turning 40 in a little over a month and that would be a PERFECT gift for him. Oh, man, my little feller would love, love this. Actually all three of my little fellers would love it. They would probably fight over it. Shoot. Now I'm not so sure about the wisdom of wanting such a thing in my house. Aw, heck, it is just too cool, though. They will just have to duke it out if you pick me (pick me :)). Uh, Yeah! Who wouldn't want that? My Dad would love it! His birthday is coming up soon, and he is a MASSIVE Ghost Busters fan! That is so cool! I've been trying to think of a way to incorporate my love of all things Buffy in my office space, and this just might be the ticket! I've seen Ghostbusters at least 75 times. I can pretty much say the entire movie as I'm watching it (which annoys the heck out of anyone watching it with me). I'd love to have your other glossy. Oh wow. I didn't mean that to sound so dirty. What a great idea. I like the colourful version you got signed, better than the green one - it's warm and interesting. You did a great job on it! I'm so going to do this with all my favorite Firefly quotes (I call them Mal-apropisms, hehe)! Wonder if any of those sites let you upload your own border shape? I could do the ship's silhouette or the Serenity kanji...That would be great fun on the wall in the TV room. I would love a copy. How generous! I love Wordle and have used it a lot. One cool thing I have seen is when someone took the various presidents inauguration speechs and put them into wordle. I also have taken a paragraph from a chapter in a book before. There are so many cool ways to use it. I would adore it, it would fit in my geek room which is filled with Star Wars, Dice, Delirium (Neil Gaiman, Sandman series) annnd cross stitch tardis! Missing some serious Ghost Busters! I swear you have the best things! My daughter would love this! She is a geek-girl in the making. She is obsessed with Ghostbusters. Her movie every night is Ghostbusters or the Ghostbusters cartoons. She even says she wants to be Janine when she grows up! Me and my boyfriend are such huge geeks. I think this would be the perfect birthday gift for him :) Ghostbusters is one of his favorites. OMG I would love this so much! My husband and I have a Ghostbuster's movie night at least once a month. My 6 year old daughter is also into Ghostbusters. She would think this is the most awesome thing ever! Have you seen... these http://society6.com/product/Star-Wars-Episode-V_Print?tag=movies-tv ? I have used wordle before and LOVE it but I am going to try Tagxedo to do shape poetry...thanks for the info! Oh, yes, MUST have this and waaaaaayyyyyy too lazy to make it myself. I must throw myself on your genius instead, basking in the reflected light of your geekiness. I bow to you. Wow, if I'm lucky enough to be picked to receive the print, I'd give it to my nerdy (and spectacular) father who has a fantastic collection of all things 70s/80s set up in his office at the local college. And now, to play with this word cloud program! As the treasurer for the Alabama Ghostbusters, a long-time CW reader, and an Epbot follower, I am compelled to beg for the extra copy of this print. I'll jump on the bandwagon with the "Who wouldn't want this?" Pick me, pick me!!! Jen, you wrote "Sadly there's no way to make punctuation transfer, though"
I highlight the sentence I want and do a find/replace. In the find window, hit the space bar once. In the replace window, type ~ If the word cloud program won't let you do it, you could do it in pages or text edit, then import the ~sentences to the word cloud thingey. We call that a niño in Cañada. Should it be Dañ Ackroyd then? I would love it for my son, whose favorite movie is Ghostbusters. I think the colors are beautiful and I love the font. Now I want to go play on those sites and spend waaaay too much time messing around with word clouds. What? Oh, right. Yes, please, allow me to throw my name in. It's lovely. What did Dan say when he saw it? What a fun idea! We go to comic con and other cons all the time, and I always thought it would be cool to have some FUN things for people to sign. That reminds me, I have a cute picture to e-mail you from Wondercon this past weekend. It involves a very tiny batman (probably 4 or 5 years old) posing with the penguin (he laid on the ground and batman stood triumphantly over him). I would love this! Ghostbusters is one of, if not my all time favorite movie. When I was doing my BSc, my favorite thing to do was yell at my Art major roomates was "Back off man. I'm a SCIENTIST!" Sadly, that never solved any disagreements but you can't blame a girl for trying. Hi Jen! Great job and it brought to mind one of my own favorite artists that works along the same lines - his name is Scott Smith and his Etsy shop is Skahfee Studios (http://www.etsy.com/shop/SkahfeeStudios). I can personally vouch for the awesomeness of his work as he created two custom Firefly/Serenity prints for me! The Serenity print has the entire script and the Firefly print has my own favorite quotes. Really, take a look at his prints. He does amazing work and it would be awesome if you had a post about it in your blog, because he definitely is something special and I would squee out loud if he got lots of traffic and exposure. He is also an absolute DREAM to work with if you have a custom job. Love your Ghostbusters piece and it is awesome that you got Dan to sign it!! I'm not posting to win the print, but to laugh about not being able to find the tilde on the keyboard. I only know that sign is called a tilde because in the early days of computers I worked in a government office that had a system that used tildes as command codes. Fun fun fun! I fighting a feeling of guilt for all the sweet people who want the print for their loved ones, but I would really love to have it for me. And if my loved one tried to touch it I'd smack his hands. So despite my lack of altruism, I promise that I would love it, and give it a good home, and a place of honor in my home library. Where I would 'casually' mention to all guests that it was from The Jen of Epbot and Cakewrecks, and they could commence admiring from a proper distance. Just wanted to let yiu know, that I wrote a really short post about tagxedo & mentioned &linked to your blog today. I would LOVE LOVE LOVE this...my 9 year old daughter is a HUGE fan of Ghostbusters and would think that this is awesome. Having something that *YOU* made, would totally make my week! I would squee like no one has ever squeed before! I would love this! Ghostbusters was the first movies paid to see more than once. I can quote the entire movie and have the entire collection of the cartoon series as well. The Real Ghostbusters cartoon was the best of the animated versions. I just want to let everyone know that I tried Tagxedo, and once I got used to it, I made an amazing word cloud in the form of a Tennessee Walking Horse (the horse breed I'm trying to save from abuse). I am so happy with it, so I think I'm going to be making more and more! Thanks for introducing me to my new addiction, Jen! Even if its not signed i still want it. That is awesome I love Ghostbusters. Okay, so my first time commenting on your website and I'm going to sound like a crazy person/borderline stalker. I can assure you that I am not a stalker. I discovered your blog a few days ago, right before my boyfriend left on vacation. I housesat at his new apartment while he was gone, where he has not yet hooked up internet. I managed to find one unprotected connection that I could connect to for about five minutes and then it would kick me off and not let me back on until the next day. So I opened as many pages on your site as possible in those five minutes so I could read to my heart's content once it kicked me off. But I couldn't comment. So this is me commenting. 1. I love your site to death. 2. I like the first tag cloud best and think you made the right decision. 3. I don't how, but I've never seen Ghostbusters. This will be remedied at once, I can assure you. 4. I have a blog, which isn't nearly as wonderful as yours, but if you'd pop by, I'd be honored. http://happeningsfromanundisclosedlocation.blogspot.com/ Please excuse the mess. I'm in the middle of doing a complete redesign. It's not the printer's fault! Backlit colors on your screen are always going to be brighter than flat colors on paper. It's just the way they are, and why we have Pantone colors for print work. Making it CMYK in Photoshop should make it come out closer to what you see on screen, though, I'm pretty sure.